An Operational Amplifier usually referred to as an Op-Amp for brevity, Op-Amps are among the most widely used electronic devices today, being utilized in a vast array of consumer, industrial and scientific devices. In present days electronics system, a basic building block is the Operational Amplifier. The Operational Amplifier is a versatile device that can be used to amplify DC input signal as well as AC input signal and used for computing mathematical function such as addition, subtraction, multiplication, integration and differentiation, and due to the ability to perform these operations the name Operational amplifier stems. Scientech 2323, Op-Amp Application Platform student can study the basic applications and will be able to perform the various application of operational amplifier. 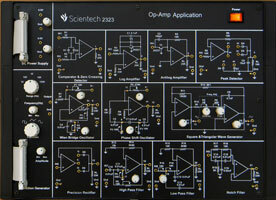 The Op-Amps were used to model the basic mathematical operations addition, Subtraction, Integration, Differentiation, Rectification, Oscillation, Filtering, Peak detection, comparison and so on. However, an ideal operational amplifier is an extremely versatile circuit element, with a great many applications beyond mathematical operations and to understand and perform those application it is necessary to achieve better understanding of its basic application. 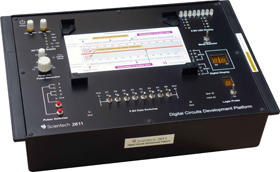 Scientech 2323 has been divided into different independent blocks for the ease of user to understand the various application of operational amplifier. 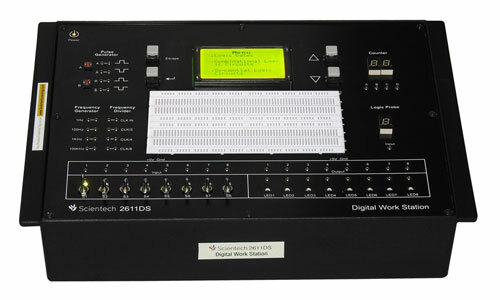 A function generator, generating Sine wave, Square wave and triangular wave, and two variable DC supplies are provided on board. Scientech 2323, Op-Amp Applications is an ideal platform to enhance education, training, skills & development amongs our young minds.